The Rio Grande near Boquillas offers an easy canoe trip for 2 hours on the water. We meet at the row boat landing, and then drive upstream to the warm springs pool, where we take time to enjoy the waters and view the evidence of ancient inhabitants who ground their grains in mortar holes carved into solid limestone. 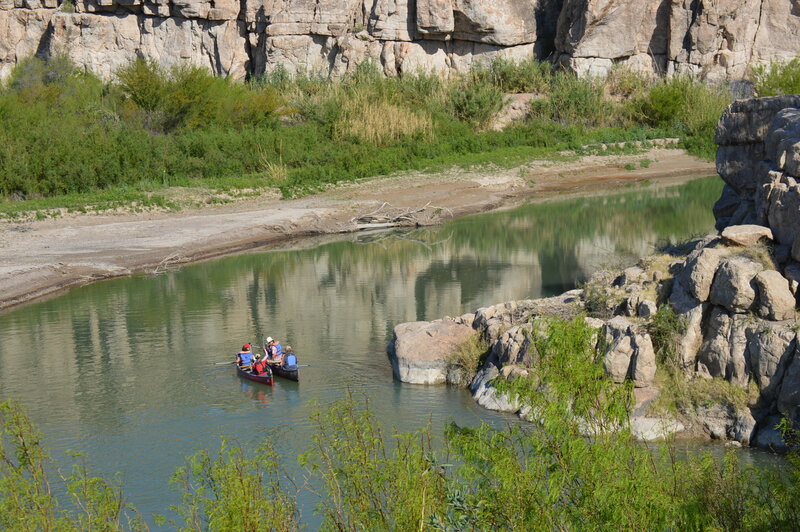 We paddle down to the entrance of Boquillas Canyon. Then we leave the canoes and hike into the canyon and visit scenic views and historic sites. A pick up truck transports the participants back to the village for lunch at one of the two local restaurants. Our guests enjoy a leisurely lunch and then have time to walk around town and perhaps purchase some of the local crafts. When our guests are ready, we drive them back to the river to catch the boat ride to the other side. Cost per person is $80, which includes the ferry boat, full lunch, guide(s), ground transport, canoe and equipment. For an extra $5, ride a burro to the river put-in point. Email info@boquillas.org to check availability and with questions. These tours are operated by local guides under the supervision of a team with decades of experience on the Rio Grande and rivers all over Mexico. Ernesto Hernandez, from Xalapa, Veracruz Mexico and his colleague Enrique Suzan, worked many years for Far Flung Adventures as river guides. Mike Davidson, co-founder of Far Flung Adventures and director of Boquillas International Ferry, is the US based coordinator. As of Dec 1, 2018, our canoe guides in Boquillas, led by team leader Chalo Diaz, will be certified by the American Canoe Association as Swiftwater Rescue Technicians. Chalo Diaz is our go-to guide in Boquillas. Chalo speaks English well and is intimately familiar with the area. Chalo leads tours into the Puerto Rico Mine as well as the local villages of Las Norias and Ojo Caliente. These itineraries are flexible, and include either a picnic lunch or lunch with a local family. 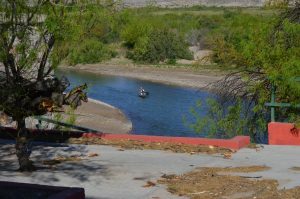 The Village of Boquillas is heavily impacted by tourism, but the small villages nearby rarely see visitors, and offer a glimpse of authentic Mexico.